Our Year 7 “Welcome Social” is being held on Thursday 23rd February from 3:30 to 5:00pm in the school theatre. 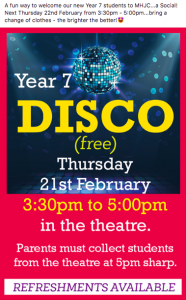 Students are encouraged to bring Fluro (or bright) coloured mufti clothes to get changed into after school, then head straight down to the theatre. Teachers have organised a numbered ‘bag check’ to carefully secure school bags and devices in the drama room. There will be prizes for the best dressed, a range of dancing competitions for those who are up for the challenge, plus spot prizes! The social concludes at 5:00pm sharp. Parents are required to pick up children AT THE THEATRE DOOR at 5:00pm, please. No student will be permitted to leave the theatre without a parent or guardian present (ie. students will not be able to walk home, meet parents outside the theatre, or in the bus bay).